Warning: This is a review of the fourth book in the series. Therefore, it might contain spoilers from the first 3 books. This might be my favourite Animorphs book so far. It's narrated by Cassie, who's my favourite character. She's the one character who I don't find has any annoying characteristics, so her narration seems more neutral to me; I wasn't made constantly aware of the narrator the way I was with some of the others. The Message also has a nice plot arc that I felt was somewhat lacking in some of the others, especially The Visitor. This book starts out with Cassie and Tobias both experiencing the same dream, in which they're in the ocean, and hear someone calling to them. They determine that these dreams are the result of an Andalite who is stuck under the ocean calling out for help. So, bring on the dolphin morphs! The dolphin morphs have Cassie a bit worried; she thinks that morphing an intelligent creature might be immoral, because it would be similar to how the Yeerks take over people's brains. I didn't really understand that, since they aren't actually taking over anyone; they're transforming their own DNA. But I guess Cassie was thinking of their morphs as basically being clones, which they then control. So this philosophical question pops up throughout the novel. The intelligence of the dolphins added an interesting factor to the morphing in this book. 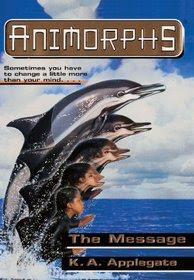 The Animorphs learn about dolphins' instinctive attitudes towards sharks, and to whales, which they call "great ones". At one point Cassie actually has a conversation with a whale, through pictures and emotions. That was pretty neat.